In 1882 the signals, and possibly some of the points, at Ware were operated from an outdoor frame near Viaduct Road bridge beside a hut, to give the signalman shelter, about 150 yards away from the London end of the then very much shorter platform. Points in the sidings adjoining the single running line through the station were worked by ground levers beside them though. There was then no interlocking between the signals and points to prevent the signals showing indications which conflicted with the position of the points; had there been the accident which occured on the night of Wednesday 8 November 1882 might not have happened. At that time the line was run on a system of time interval working under which no train was permitted to leave any station until a set time period had elapsed since the departure of the train ahead. This is a pretty rough and ready way of keeping trains apart which relies on all of them running at the same speed, none of them running late and none of them stopping unexpectedly between stations. Three days after the accident the Board of Trade ordered an inquiry and Major-General C S Hutchinson of the Railway Inspectorate was appointed to conduct this. His completed report went to the Board’s Railway Department on 23 December 1882, who forwarded a copy to the Great Eastern Railway Company on 4 January 1883. The circumstances of the accident were as follows: at 10.31 pm on the night of Wednesday 8 November 1882 the 10.17 pm passenger train from Broxbourne ran into part of the 8.45 pm goods train, also from Broxbourne, which was standing on the single line near Viaduct Road bridge after being left there whilst the wagons for Ware were shunted off by the locomotive. Two passengers, but no railway staff, were injured and fortunately there were no fatalities. The brake van and two of the wagons in the goods train were damaged though and one of the wagons was derailed. 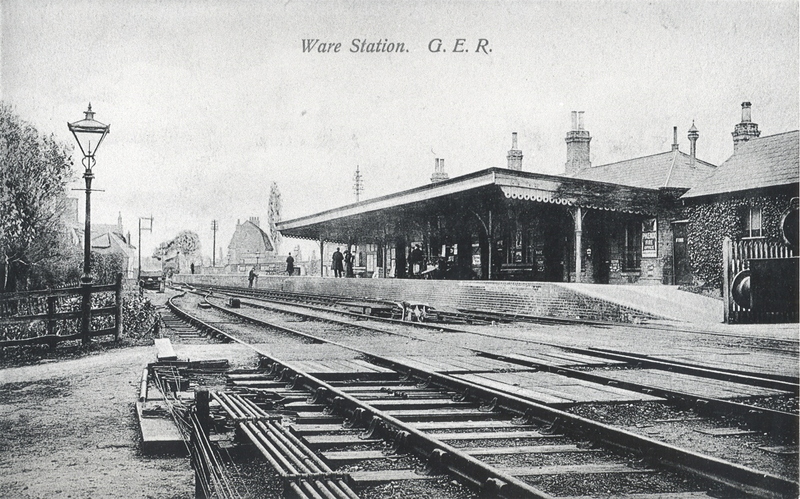 The goods train was scheduled to arrive at Ware at 9.20 pm and leave at 9.25 pm, however it was running late and had not arrived until 10.05 pm. This was one of the factors contributing to the accident. Driver Richard Taylor, together with Fireman Robert Skeggs and Guard Richard Kennerell left Broxbourne on time with the 10.17 pm passenger train to Hertford consisting of a four coupled tank engine running chimney first, four carriages and a brake van at the rear in which Kennerell was travelling. The only brakes on the train were a Westinghouse air brake, which acted on the locomotive’s coupled wheels alone and not throughout the train, a handbrake on the loco and a handbrake in the van. Taylor, who had driven on the branch for 16 years, told Hutchinson he approached Ware under clear signals and had no reason to think anything was amiss until he briefly caught sight of a goods train’s tail lights directly ahead as he was approaching Viaduct Road bridge. He immediately applied the locomotive’s brake and also used its sanding gear, but did not have time to whistle for Kennerell to apply the handbrake in the guard’s van before his train ran into the stationary goods wagons at between 10 and 15 mph. His fireman confirmed this, adding that he was also applying the loco’s hand brake himself once he had seen the stationary goods train ahead. David Wright was on duty as Relief Signalman at Ware on the night of the accident and it was only the fourth time he had worked there. Relief signalmen were required to work at a number of locations, often at short notice, to cover for illness, rest days and annual leave of regular signalmen. An indication of the wide area over which he was expected to work was shown by the home address in West Ham which he gave at Major-General Hutchinson’s inquiry; all of the other railwaymen involved in the accident lived in Hertfordshire, either in Hertford or, in the case of Kennerell, Buntingford. Wright admitted leaving his signals clear once the goods train had arrived, but went on to say that on previous occasions the goods train guard had always returned them to danger for him whilst he was assisting with shunting in the sidings. Hutchinson did not accept this excuse and blamed Wright alone for causing the accident. Goods Guard William Futter told Hutchinson that his train had been incorrectly formed at Broxbourne and the wagons for different destinations were dotted about within it instead of being grouped together as was usual. This meant he had to spend 25 minutes [instead of the allotted 15] shunting wagons off at St Margaret’s and a further 25 minutes [instead of the timetabled 5] shunting at Ware. “Had the points and signals been properly interlocked at Ware station this collision would have been prevented, as shunting could not in that case have been commenced after the arrival of the goods train until the signals had been put to danger. Nor would it have occurred had the branch been worked on the block system properly carried out. Both time interval working and the absence of interlocking between signals and points were outlawed in 1889 by the Regulation of Railways Act, swiftly passed by Parliament in August of that year in the aftermath of a disastrous accident at Armagh on 12 June 1889 on the Great Northern Railway of Ireland in which 78 people were killed and 260 injured when the rear portion of a non continuously braked excursion train ran away down a 1 in 75 incline. 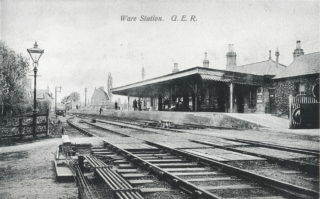 Ware can therefore perhaps claim to have a small place of significance in railway history as the location of one of the accidents ultimately leading to the 1889 Act, which enforced interlocking, absolute block working [separating trains by distance rather than time] and continuous automatic brakes on passenger trains on every British railway company. The Great Eastern Railway acted promptly in the light of Hutchinson’s report. Unfortunately it took 78 deaths, including those of 22 children, and 260 people injured, among whom were about 85 children, at Armagh before Parliament finally closed the era of slap happy railway operation which had allowed the Ware accident to happen. On 6 February 1883 the Great Eastern’s Way & Works Committee agreed to invite tenders for interlocking the signals and points at Ware. At their meeting on 20 March 1883 they accepted a bid to carry out this work for £716-4-0 [£716.20] from the well known signalling engineers Saxby & Farmer. Oddly, there is no record of a Railway Inspectorate inspection of the new installation even though this was a statutory requirement.